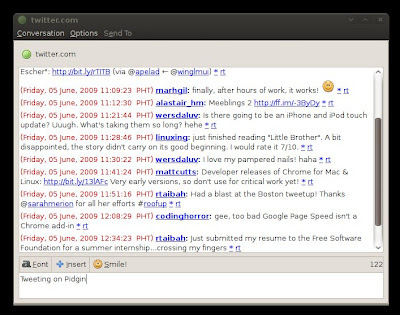 Pidgin is a multi-featured instant messaging desktop client that is very popular among Linux users. 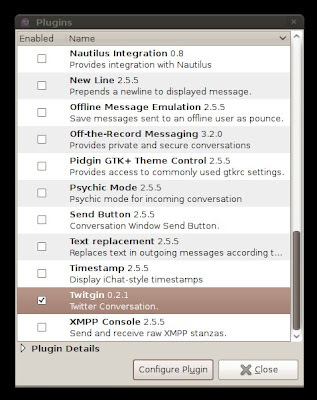 It supports a wide range of chat networks like Yahoo!, AIM, Google Talk, ICQ, and IRC. You can even send and receive SMS (Text Messages) for free via Pidgin. So if it can do all these, does it support everybody's favorite micro-blogging platform Twitter? --Yes it does. 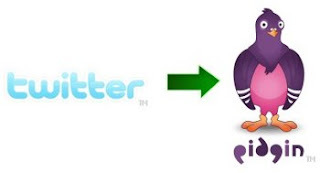 Thanks to a plugin called microblog-purple you will now be able to send and receive tweets via Pidgin. After adding the above repositories, close the Synaptic Package Manager. 7. You can now start tweeting via Pidgin! 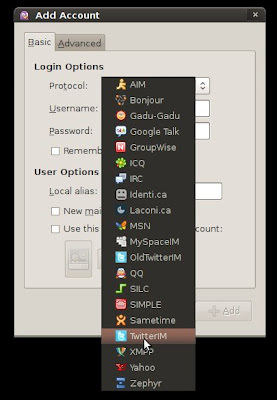 I already have Pidgin set up to run Identi.ca by using a Jabber account in my Identi.ca profile. Is Twitter free software? Do they have a free software approach to our information? I use Identi.ca a free and open microblogging service. This is nice plugin but unfortunately Windows version was too unstable for me for some reason. Have to check again later. Are you sure? There are a lot of people who prefer identi.ca over twitter. Twitter is too mainstream so on geak persons recognize it, but identi.ca/laconica is the technical better solution! "Failed to fetch http://ppa.launchpad.net/sugree/ppa/ubuntu/dists/intrepid/Release Unable to find expected entry deb-src/binary-i386/Packages in Meta-index file (malformed release file?)" "Some index files failed to download, they have been ignored, or old ones used instead." Is there some way to fix this? 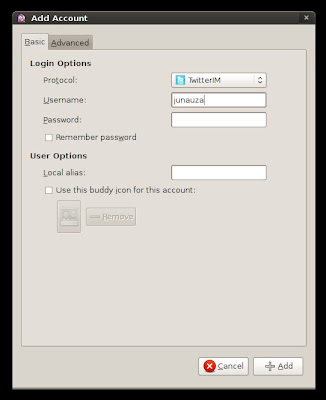 Or is tweet-via-Pidgin not going to work on Eeebuntu? ok.. but.. in puppy linux what is the way to install the plugin? Seems to work great! After searching a few sites, I found this one. Thank you! Now twitter feeds are flooding my desktop. I love pidgin!